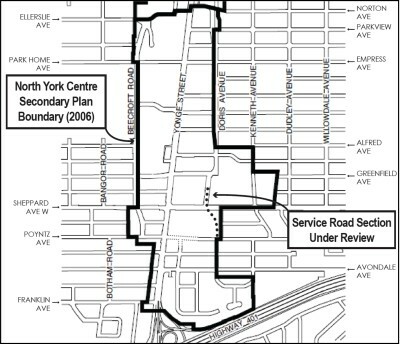 North York Centre South Service Road: Doris Ave. Bonnington Pl. & Tradewind Ave.
North York Centre South Service Road’s recommendations and timeline is contingent on the outcome of the REimagining Yonge Study that is currently active. Facilitate traffic flow and circulation. Protect residential areas from traffic infiltration. Improve cyclist and pedestrian mobility and safety. Support current and future residential and commercial growth. View the slides from the June 11, 2015 public drop-in event for a summary of the background, options considered, recommend Option B, evaluation and next steps. The new service road project is pending approval by Council. For assistance in understanding these materials, please email or contact Jason Diceman at 416-338-2830. The official title of this study is the North York Centre South Service Road Municipal Class Environmental Assessment Addendum. Both Beecroft Road on the west and Doris Avenue on the east function as service roads, providing access to many of the residential, business and institutional buildings in North York Centre, and forming an important part of the local network. This project is an important next step in achieving the goals of the Official Plan, and is part of the North York Centre Secondary Plan. Completing the Service Road, by linking Doris Avenue with Tradewind Avenue, would improve mobility and access, relieve congestion on alternate routes, improve cyclist and pedestrian mobility and safety, and support current and future residential and commercial growth. 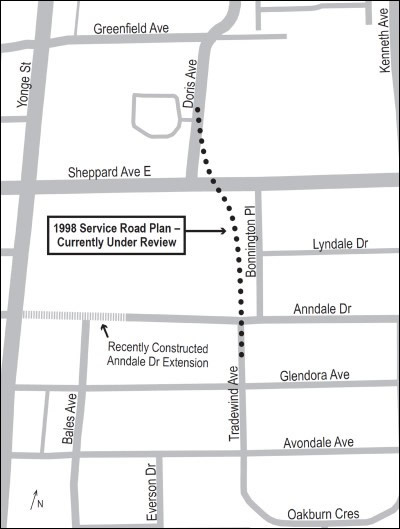 The Service Road is intended to form a boundary for the high-rise development along Yonge Street and is designed to protect existing residential neighbourhoods from traffic related to North York Centre. The current configuration of Doris Avenue, Bonnington Place, Tradewind Avenue, and Sheppard Avenue does not achieve these goals. We have investigated various alternatives to see which ideas are feasible and what would be the negative and positive impacts of each. All users – autos, trucks, bikes, and pedestrians – are included. In analyzing the options, we are considering issues such as traffic operations, safety, property impact, parkland and open space, utility impact, road geometry, neighbourhood impacts, and capital cost. On June 11, 2015 the City hosted a Public Drop-in Event from 6 p.m. to 8 p.m. at Earl Haig Secondary School (100 Princess Ave.). 57 participants attended. We also received 72 completed comment forms online. A report on the consultation results will be published as part of the final report. Over 75 people who participated in our March 2014 public consultation event and to those who wrote in with comments following the event. Thank you to the over 75 people who participated in our March 5th public consultation event and to those who wrote in with comments following the event. While we did hear a range of opinions, there were some common themes. Efficiency of traffic circulation is a top priority. Preference for single intersection (Options A and B) mostly for traffic flow and safety of all road users. The design should avoid residential driveways directly on to the service road, as this could cause traffic delays and challenging situations. Concerns this plan will encourage traffic infiltration in to the residential neighbourhoods, and would make rush hour congestion worse. Concerns about pedestrian safety (e.g. wide crossings) and convenience (indirect vs. direct connections between streets and destinations). 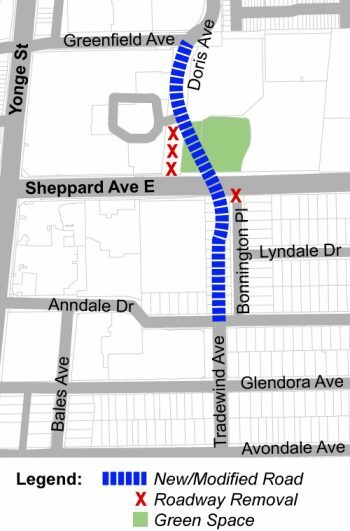 Congestion on Anndale-Yonge-401 should be addressed as part of this project. The potential for an improved urban park and more green buffers was appreciated, but not seen as top priority (compared to traffic congestion). There is a desire for quick implementation. Concern that City might allow further towers to be built east of Bonnington once additional traffic capacity is introduced by the Service Road. Questions/opposition to 49 Sheppard Ave. development as a barrier to service road implementation. The utility of the bike lanes was called into question. This general feedback, along with individual communications with stakeholders, was taken into account when evaluating and finalizing the recommended design. Public consultation is an important part of this study. You are invited to learn more and to share your insights and opinions at any time.